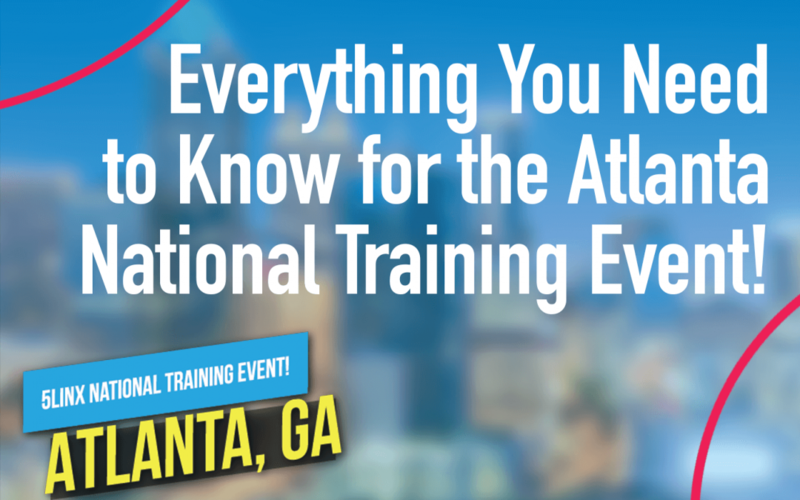 Here’s some need-to-know information that will help you maximize your experience at our upcoming National Training Event in Atlanta, October 10-13. Be at the center of all the action with 5LINX Social Media. We’ll be posting live onFacebook, Twitter & Instagram. Be sure to post all of your pictures and videos from Atlanta with the hashtag, #5LINXatlanta. You never know when your post will be featured on our page! Assign your event tickets ahead of time through the Ticket Manager in your Virtual Office. For assistance with this process, please give our Representative Services a call at 585-359-2922. You’ll need your photo ID and your RIN number, so be sure to have those ready while waiting in line! Our event will be held at the Atlanta Convention Center at AmericasMart in Building 2. Click here for directions. Registration & the 5LINX event store will open at 3:00pm on Wednesday, October 10. On Thursday, we will host Breakout Training Sessions from 10:00am-5:00pm. Friday, General Session starts promptly at 9:30am and Saturday starts with our worship service at 7:30am. To check out our outlined schedule, click here. Atlanta attendees will be able to register on Wednesday for our next National event in New Orleans! We will also be offering an All-Access Pass this year, getting you tickets to both of our 2019 events. The lowest ticket rates will only be available during this event. You can sign up quickly & easily in the 5LINX event store. Just head up to the registers to sign up – no form necessary! Renowned businessman and New York Times Bestselling Author, Stedman Graham will be joining us Friday as the keynote speaker on main stage, with an autograph session during our lunch break on Friday. Be sure to pick up a copy of his book at the 5LINX Event Store! Be sure to stop by the 5LINX Event Store where we’ll have a variety of brand new brochures, apparel, merchandise, and much more. You’ll have the opportunity to purchase your favorite products like OXZGEN, MontaVida coffee & tea, CaptaVida, and TeeVee boxes. Not only will you save on shipping, but you’ll be able to purchase them at wholesale 1 pricing! Plus, there will be an exclusive “Mix & Match” special happening with our OXZGEN and CaptaVida products! Get registered, purchase your 5LINX apparel & favorite products, sign up for your 2019 All-Access Pass and network with your fellow representatives! Today we host breakout trainings all about our products, customer acquisition, recruiting and more! Choose which sessions you and your team will be attending! Stedman Graham takes the main stage, followed by a special autograph session during lunch and we recognize our top Representatives achievements! The final day! Watch more “can’t-miss” trainings from 5LINX Leaders, and hear all of our promotion announcements!